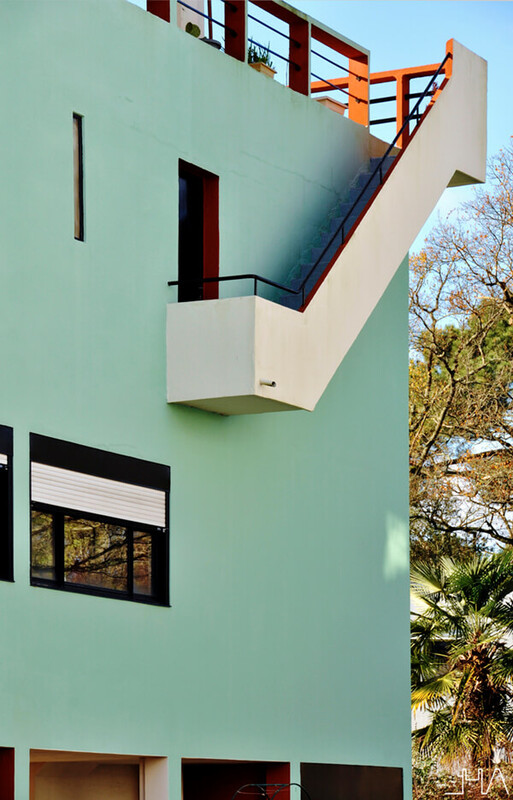 Can you imagine a city entirely designed by Le Corbusier where he could put into practice his studies about social housing? Well, not only did he have the chance to do it but we can also walk down the streets of La Cité Frugès almost a century later. This was one of his first garden cities located in southwest France. 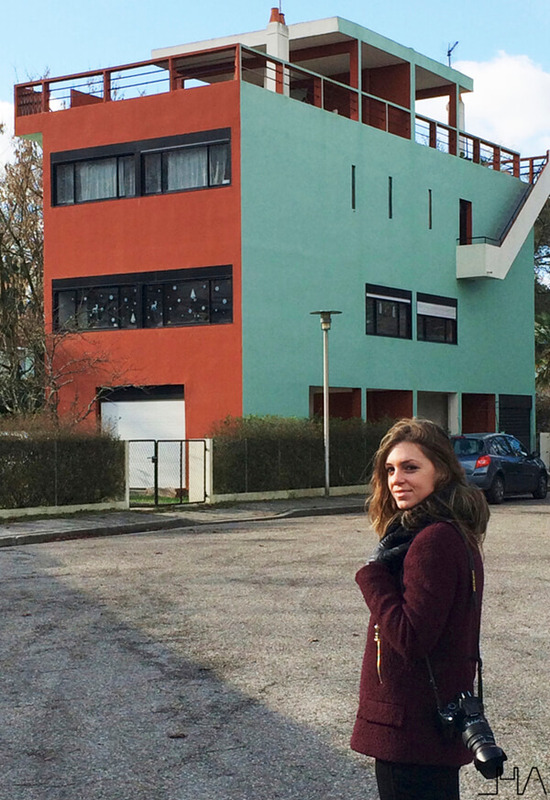 Those of you who have read some of my visits already know about my fondness for Le Corbusier’s Architecture. 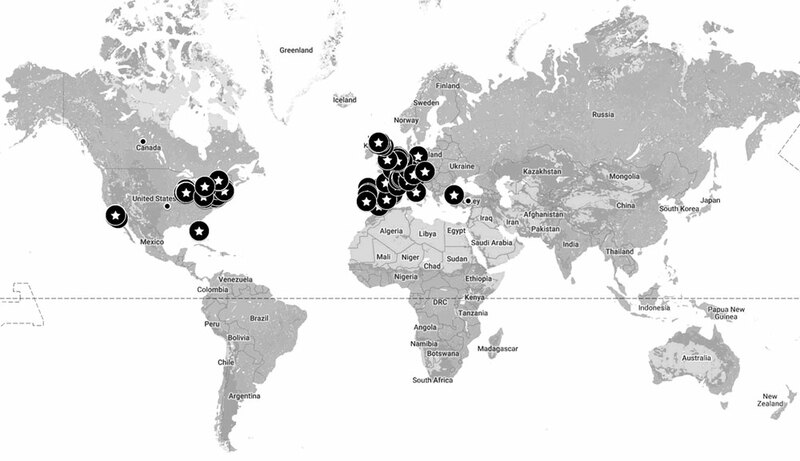 That’s why in the last months I have travelled to different parts of France and Switzerland visiting his work [see Le Corbusier Route]. Even so, I am always surprised to see that many of his ideas and initiatives still remain today. Let’s start with the visit and so you will make your own judgements. 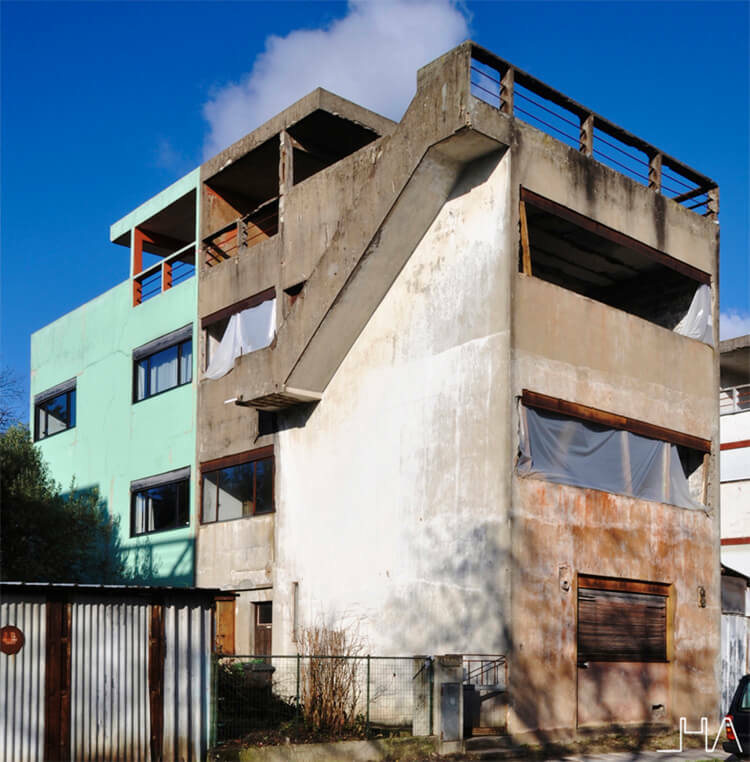 We need to go back to 1923, the year when Le Corbusier publish his book Vers une architecture -Toward an Architecture-, in which he stand up for low-cost social housing. It caught the attention of Henri Frugès, a successful sugar industrialist who was interested in all the trendy artistic and architectural innovations of that time. 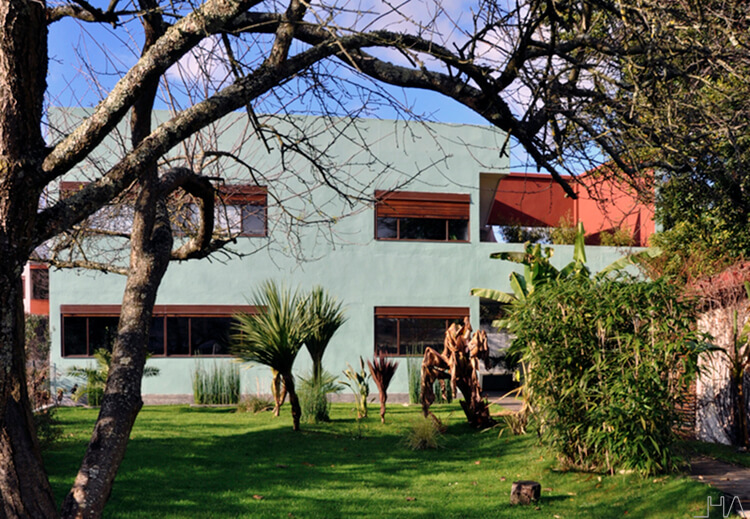 Frugès wanted his workers to live in “a wide meadow surrounded by pine trees, to create a garden town”. 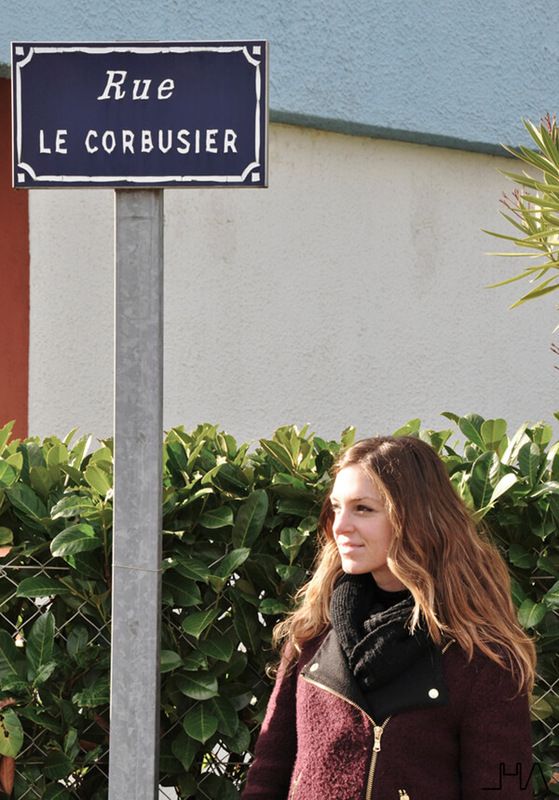 Thus, after reading Vers une architecture, he did not hesitate to contact Le Corbusier. 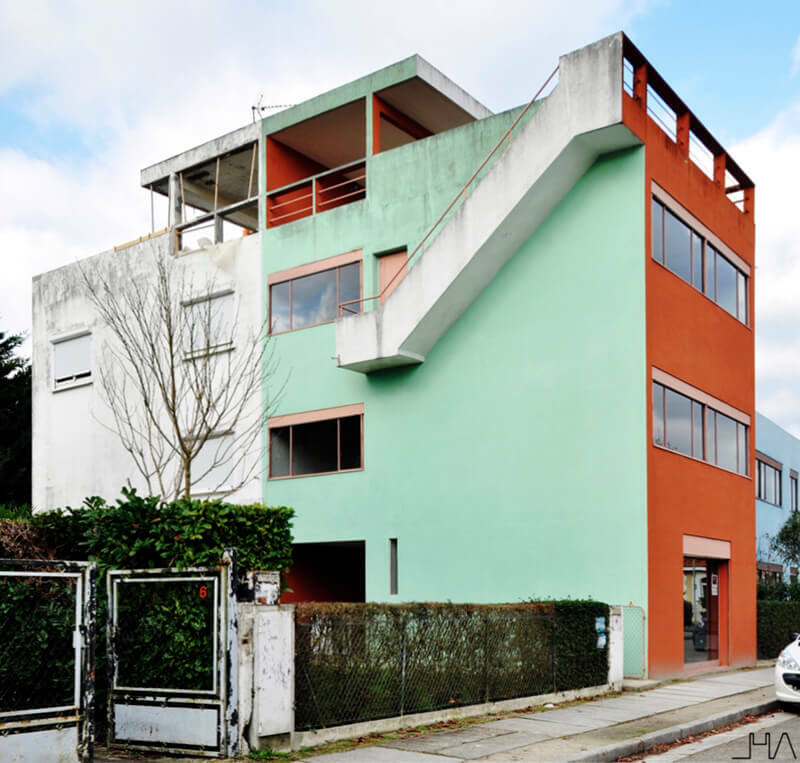 “I authorize you to put into practice your theories; I wish to achieve really concluding results about low-cost housing reform: Pessac must be a laboratory…” this was what, according to Le Corbusier, Henri Frugès commissioned him in 1924. This same year they started the construction of The Frugès Modern Quarters in Pessac, a city located 20 km from Bordeaux. The choice of place for the quarters was not by chance, but it met four important requirements for Henri Frugès. To begin with, the location was absolutely surrounded by forest and it had not been previously built. It was an appropriate place due to the proximity to the industries where neighborhood’s inhabitats would work, and the railway, a symbol of modernity, was really close. Finally, the area was near a tuberculosis hospital, an illness that was very frequent among the working class at that time. The purpose of the Modern Quarters was to provide decent housing for people with few resources. 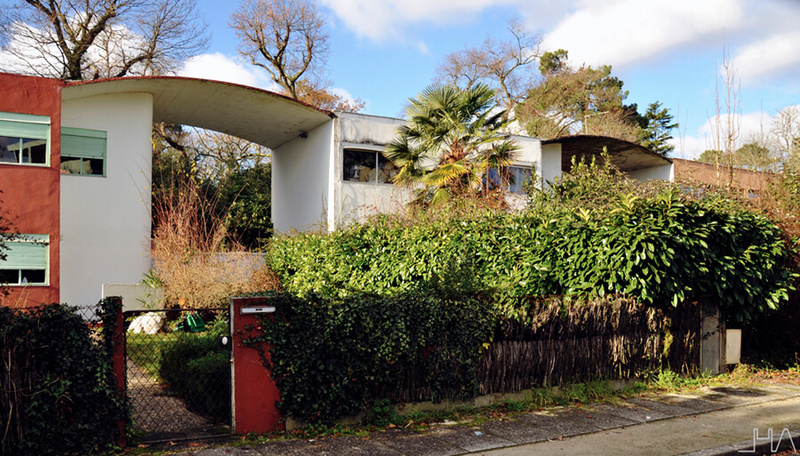 Le Corbusier designed a new neighborhood based on English garden cities, where all the houses had a piece of land to grow their own vegetables. The original project had 135 dwellings, however, only 53 houses were actually built. Nowadays, only 50 dwellings remain, since 3 of them were destroyed during the bombardments of World War II, when the target was the near railway. We can discover six different models of house in La Cité Frugès, which Le Corbusier and his cousin Pierre Jeanneret had been studying since 1914: Zig-Zag, Quinconces [in staggered rows], Jumelle [twin], Gratte-Ciel [skyscraper], Arcade [series of arches] and Isolée [freestanding]. It would be possible to post an article for each one, but we are going to focus on the whole neighborhood for now. Later we will see a Maison Gratte-Ciel in more detail, as it is the only one that can be visited. All different types are standardized housing models which wanted to be inexpensive and rapid to build. 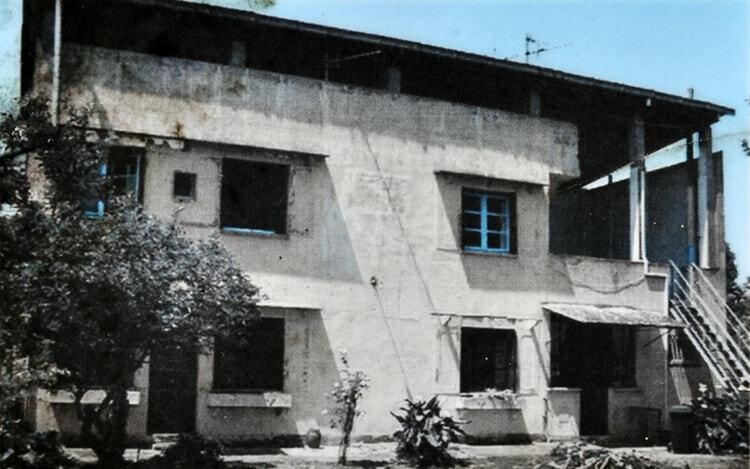 Nevertheless, the building of the quarters was very slow due to problems encountered with the technical innovations and the neglect of administrative procedures. This implied that Henri Frugès had to invest part of his fortune, what accelerated the bankruptcy. Finally, it was not possible to build the whole quarter. Here you have the different housing models. You will see that the buildings can have from one single dwelling to six. 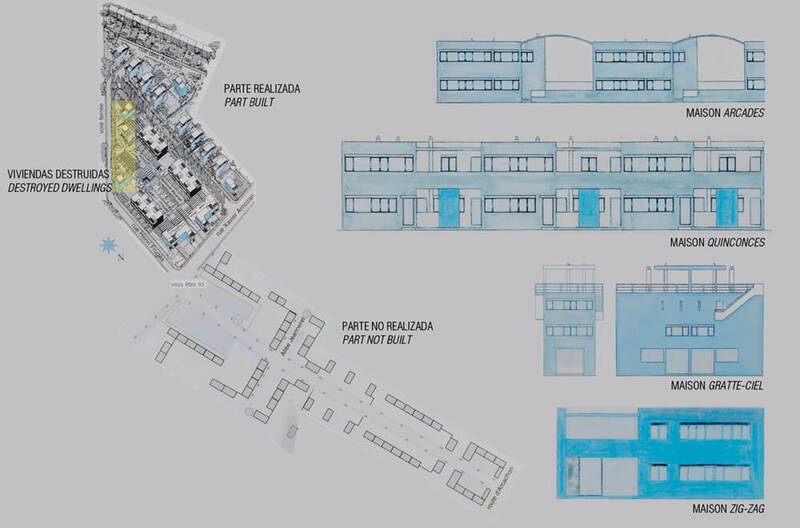 All of them share some features: accessible terraces and courtyards, oblong windows and even a space to park the car. 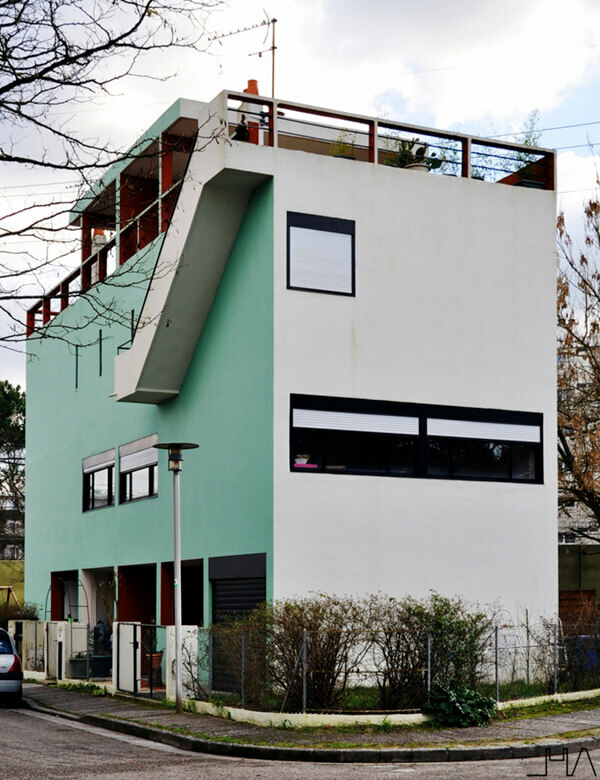 If we focus on this last point, we can see that Le Corbusier was already obsessed with the machine. Even when workers did not have their own car at that time, he thought about it. Nowadays it is a quiet neighborhood. One can find tourists looking for the perfect photography and, at the same time, some amusing cats which want to play. It would be nice to visit the different types of house, but it is not possible. The buildings are private, so we can only walk down the streets and enjoy the facades. 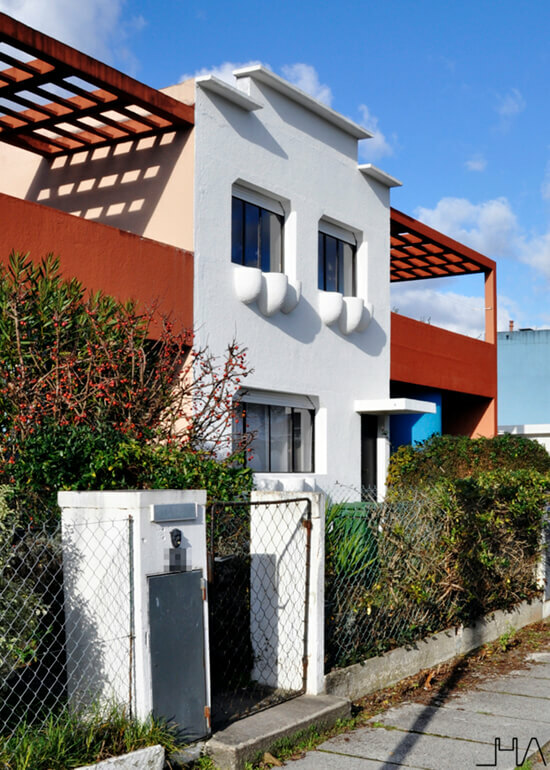 It was not until 1983 when the city of Pessac bought one of the houses and restored it completely, the Maison municipale Frugès. 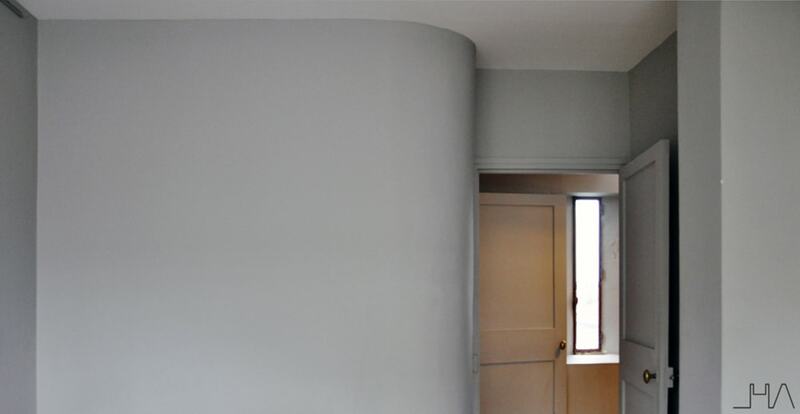 Accordingly, it is possible to have a guided tour of a Gratte-Ciel house, in which it is also explained the history and details of the whole neighborhood. 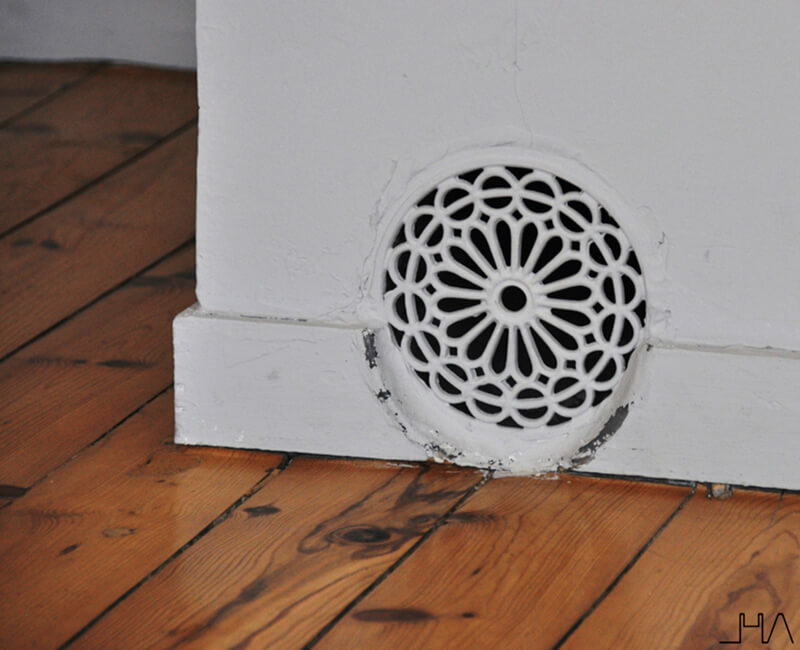 During our visit, we could see the innovations included in The Frugès Modern Quarters, such as the installation of running water or the new place for the toilet inside the house, which was a luxury at that time. The oven placed in the kitchen heated up the water for the bathroom, while the chimney of the first floor was responsible for heating the rooms through a distribution network. As a curiosity, I found quite interesting that there was a rainwater collection system to water the plants in the garden. I wish this was a widespread design nowadays. All this enhanced quality of life for the users, and then wealthy families became interested in the new neighborhood. The buildings style was described as “international” o even “German” at that time, and next critiques began. The houses were compared to the sugar cubs of Henri Frugès. As time went on, there were some technical problems in the houses due to the new building materials, and a lot of families modified their dwellings according to their necessities. Some interior spaces were divided to create new rooms, oblong windows were replaced by smaller ones that were square, terraces were covered, new sloping roofs appeared, car parks were removed… The quarter began to deteriorate over the years, and it was even suggested that demolition was the best solution in the early 70s. 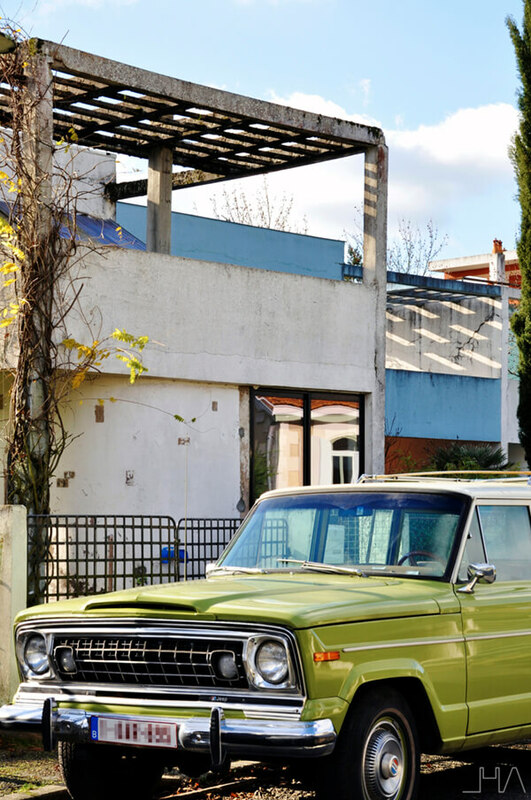 Nevertheless, an owner started to completely restore one of the houses in 1973. Later, the houses were listed as a historical monument in 1980, and it was the beginning of a process to restore all the neighborhood. Nowadays there are still many buildings in very bad conditions, and some which are even abandoned. It is not a very popular quarter among the inhabitants in Pessac. Even though there are increasingly more people who are interested in the houses and restore them. To be honest, the first impression of the quarter is really impressive. 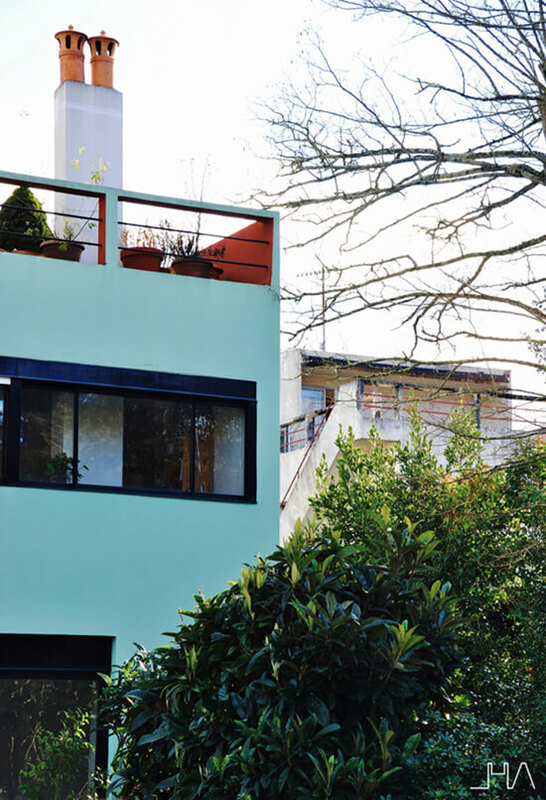 I had not seen current images, so I was really surprised by the appearance of some buildings in my first stroll through Le Corbusier street. 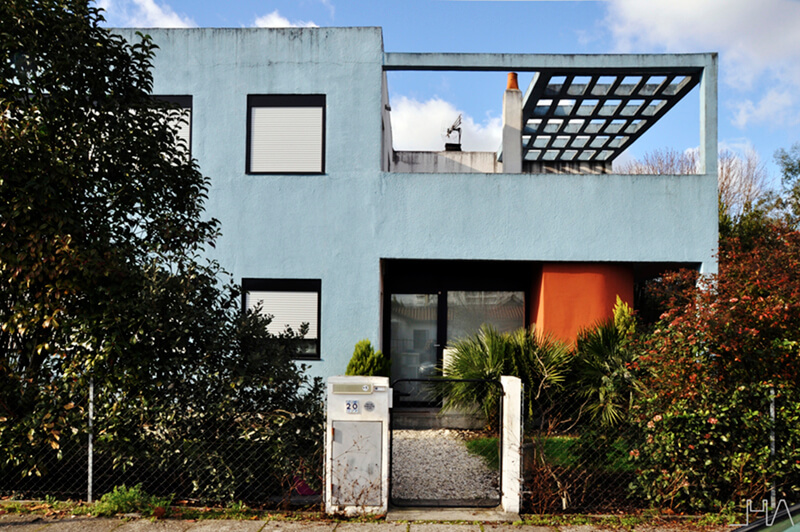 The facade colors -ochre, sky blue and sea green- were carefully used to model the space at that time. Now they are also used to show the facades that have not been modified according to the original project. 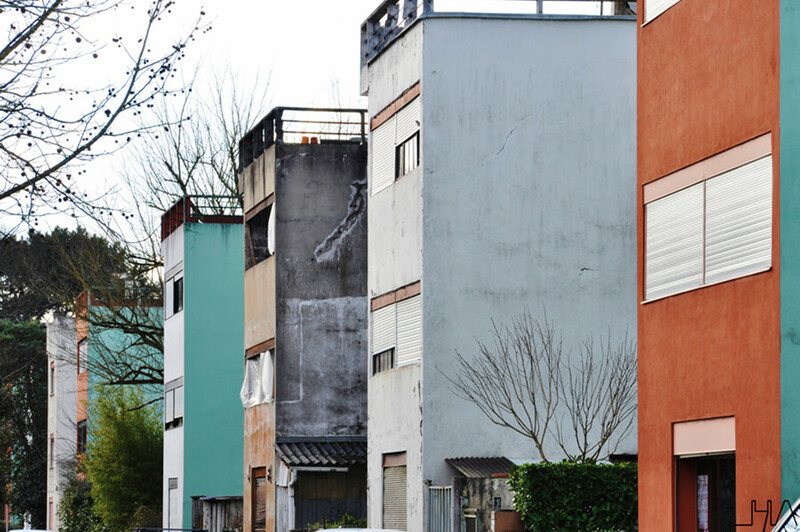 We can find some unrecognizable facades that have been absolutely changed, and these ones are painted in white. 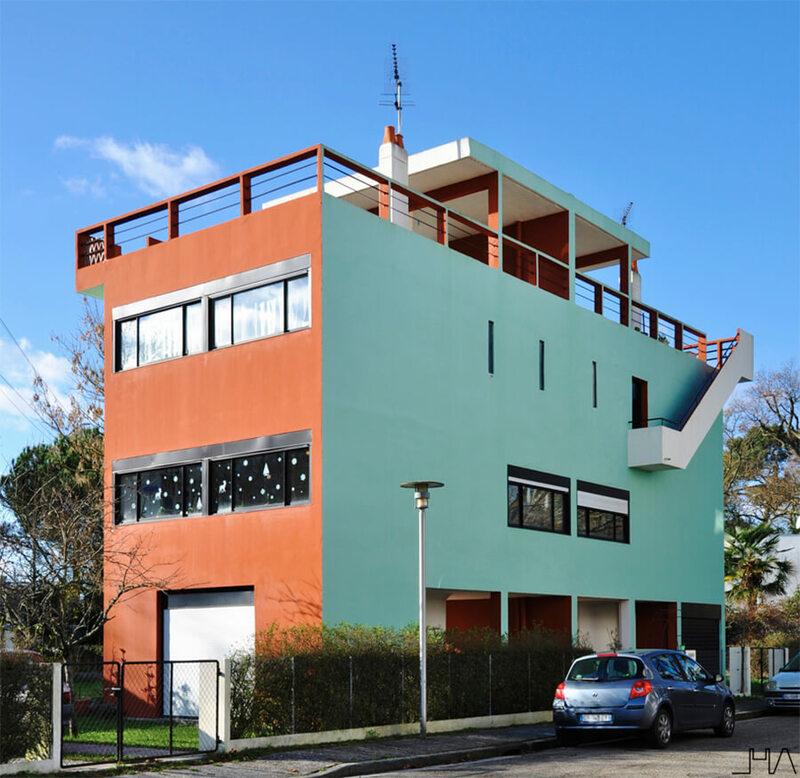 When Le Corbusier saw the changes that owners had done in their houses, he said discouraged: “life is right and the architect is wrong”. I do not know what you think about this, but I am sure that the photographs from my visit will not leave you indifferent. 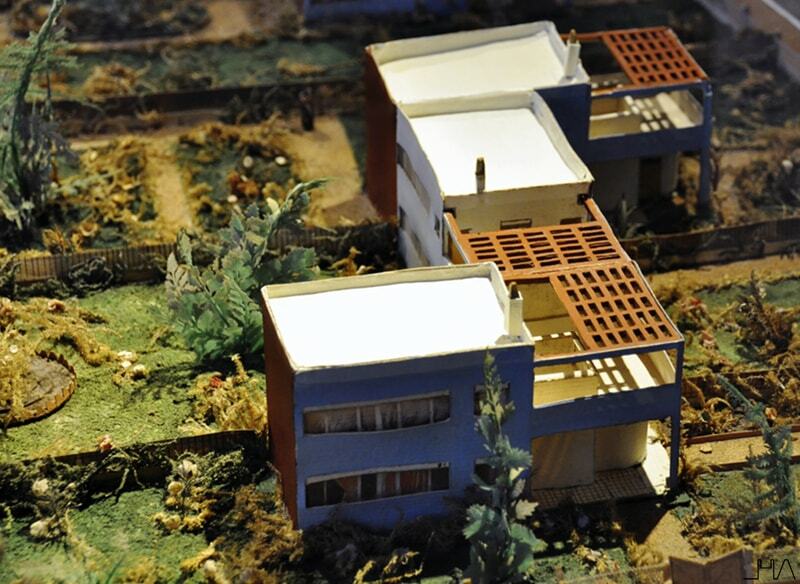 I would not like to finish with these sad images of The Frugès Modern Quarters, so here you have some photos of the miniature displayed in the ground floor of the Maison municipale Frugès. 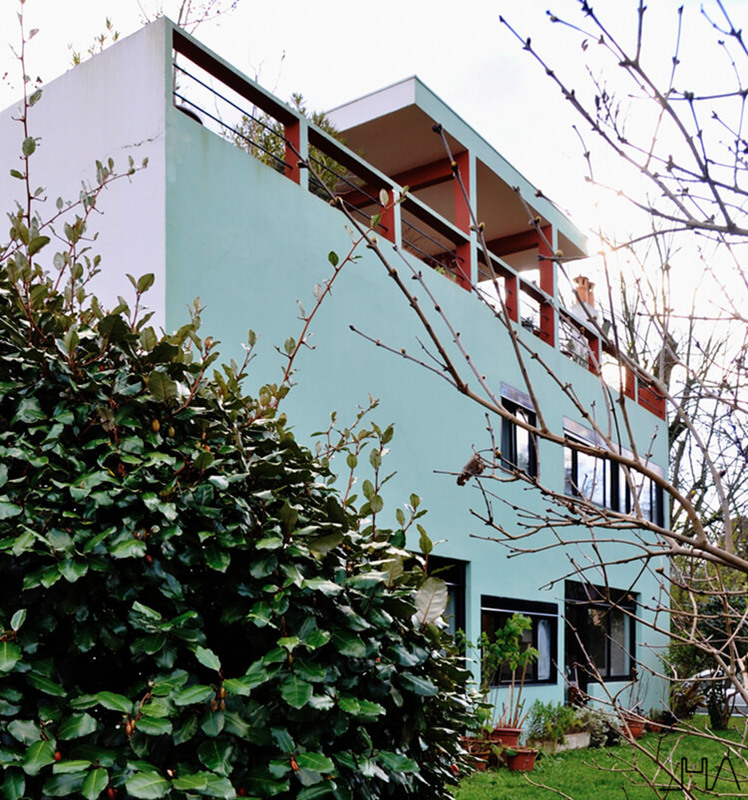 It shows the original project of Le Corbusier for the quarters, before suffering problems or later transformations. 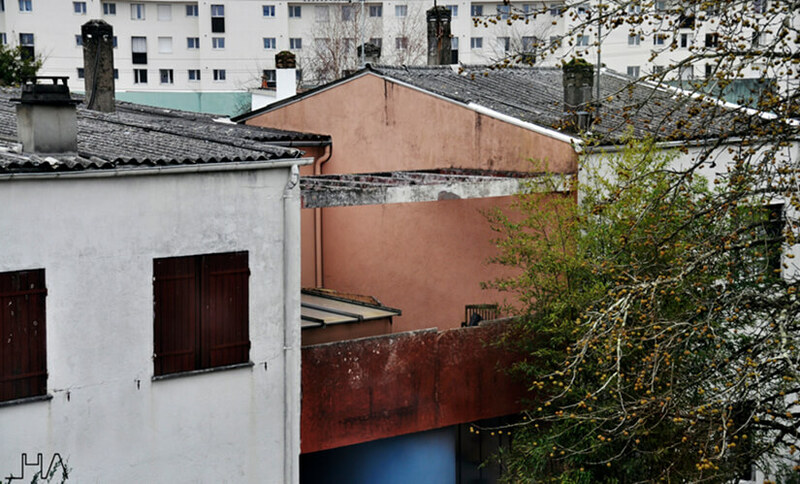 The city of Pessac wants the neighborhood renovation, and so they give technical support for the new and old owners who want to restore the buildings. It will take time to achieve it, but I hope to come back to the Modern Quarters when it happens and take new pictures for you. Last but not least, I recommend you to look at my visit to the Weissenhofsiedlung if you did not do it before. 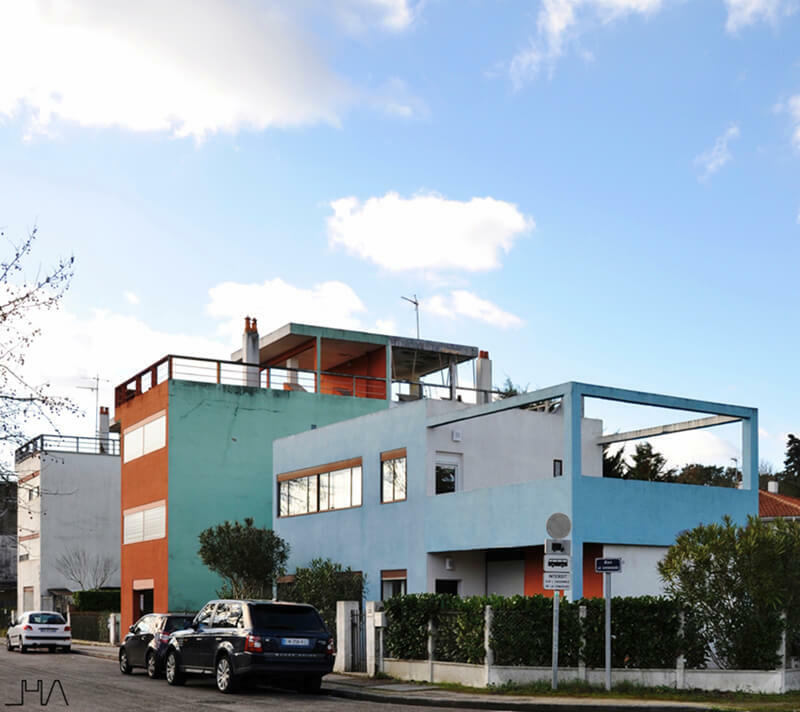 Le Corbusier was responsible for one of the buildings for the International Exposition Die Wohnung organized by Mies Van der Rohe, and in this article I went into more detail about mass housing and its industrialization. 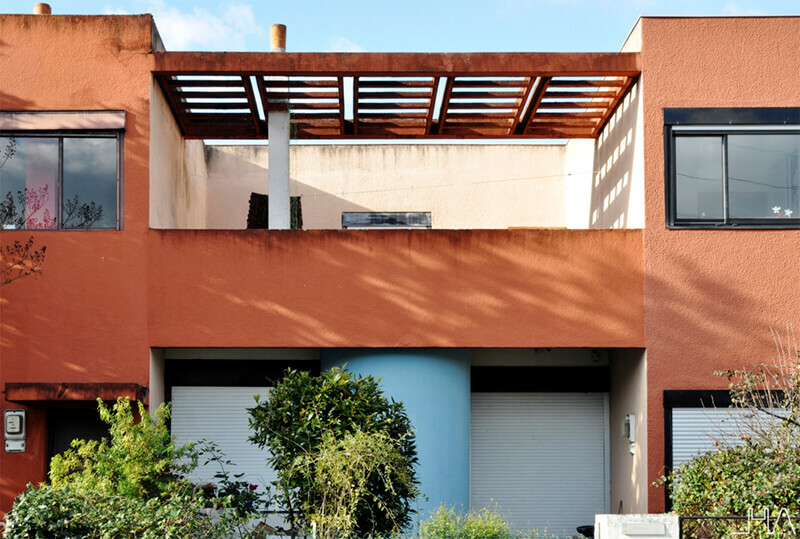 I am certain that it will give you a better understanding of this architectural style. The Frugès Modern Quartes had many innovations that were used in the Weissenhofmuseum.